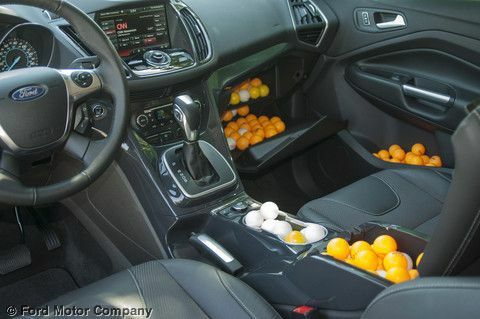 Formerly known as pingpong balls, these little wonders help Ford make the most of the space in the all-new 2013 Escape. Ford needs to account for every cubic inch of space in the all-new 2013 Escape so it came up with a novel way to measure it. Back before the internet, there used to be a popular game played in dorm rooms and activity rooms world-wide. You may recognize this sport as the precursor to what we now call beer-pong. Formerly called pingpong, or (if you once ate white bread sandwhiches with no crust,) "table tennis", beer-pong of course is the new American pastime and is considered a competitive sport in our finer universities. The small balls used to signal who drinks next are cheap, light, and easy to use as units of measure. Ford said in a press release regarding the 2013 Escape that when two engineers measure the same glove box or storage bin they often get differing results. On the contrary, when they fill the bin with beer-pong balls, and then count them, the results are more repeatable. This is most likely due to the fact engineering students spend significant time with beer-pong balls during their undergraduate studies and don’t usually own a tape measure. The use of beer-pong balls in engineering is not unusual. Looking at a liquid filled, open top tank that was being agitated by a mixer, an engineer tasked with insulating the tank to avoid heat loss came up with the idea of using beer-pong balls to float on the surface and help trap in the heat. It worked. The design was later improved when it was discovered that wontons, which are square, actually sealed better against one another. Plastic wontons are now commonplace in chemical processing. The 2013 Ford Escape is a vehicle in which every inch of space is counted. Many buyers would opt for a more expensive Ford Edge, or Ford Explorer if their budget allowed for it. Therefore, determining how to pack the most stuff into the Escape’s usable space was a huge priority for Ford. “Our team scans dozens of consumer goods from iPads to mountain bikes and wheelchairs to ensure these objects not only fit into our vehicles, but that there is a proper place for them,” says Ford Accommodation and Usage engineer, Sejal Shreffler. For many years auto magazines have used another common item to measure the rear cargo areas of vehicles, the standard case of beer. People have a hard time visualizing the difference between 13.2 and 15.1 cubic feet of space when they read it in a marketing blurb. However, if you tell them that the Ford Escape can carry 2 more cases of beer to your vacation destination than its competitor the difference it clear. Credit Ford for thinking outside the box and using the tools at hand that its engineers are familiar with to improve the 2013 Ford Escape. Video courtesy of Youtube.com and TeeRavGainer. Please note: No beers were harmed in the filming of this video. It's how they get those balls into the Escape that is the fun bit..